The government urged members of the American Chamber of Commerce (AMCHAM) of the Philippines to involve ventures of Filipino entrepreneurs into the value chain of businesses. Filipino micro, small and medium enterprises employ about 60 percent of the country’s workforce. “There is now greater likelihood of success,” said Secretary Lopez who confidently told businessmen during the general membership meeting of the AMCHAM that there are now greater chances for Filipinos to step out from poverty, with an increasing propensity of Filipinos to become entrepreneurs. The trade chief urged AMCHAM members to adopt an inclusive business model that integrates MSMEs into the value chain from supply sourcing to distribution. According to Secretary Lopez, mall owners have approved, in principle, the proposal to give high-quality products from various towns in the country considerable exposure in the mainstream market. As Sec. 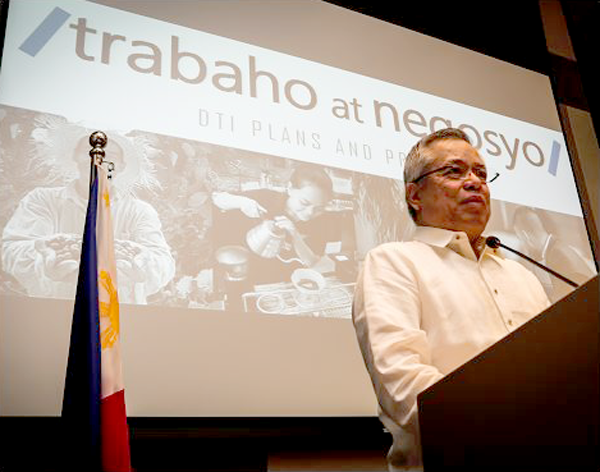 Lopez pointed out DTI’s “Trabaho at Negosyo” program, he also mentioned initiatives to improve ease of doing business, primarily by streamlining and modernizing the business permit and licensing system, in coordination with the Department of Interior and Local Government and the Department of Information and Communications Technology. To further promote MSMEs, DTI cited its Negosyo Centers that cater to existing and aspiring entrepreneurs and address their business concerns such as securing licenses and permits, improving product quality, packaging and marketing, among others. There are currently 299 Negosyo Centers across the country. AMCHAM members were also informed of DTI’s strategies to improve domestic and international markets, to maximize gains from free trade agreements and to manage the impact of ASEAN economic integration through the implementation of industry roadmaps. Sec. Lopez also called for agribusiness development, strengthened regional investment promotions, stricter consumer rights enforcement, upgraded product standard testing facilities and intensified efforts to counter substandard products. Earlier this month, AMCHAM released a statement expressing its concern over the increasing death toll brought about by the government’s intensified anti-drugs campaign. “Certainly, the illegal drug menace is a serious threat in the Philippines, as it is in the US and elsewhere. However, the increased number of killings during the heightened anti-drug campaign is harming the country’s image, as portrayed by international media, and some investors are now asking whether this campaign reduces the rule of law,” said the Chamber in its official statement.